Often a game comes along that leaves players itching to have "just one more go." This often results in subsequent tries after the first, until a good amount of time has passed. This is often a sign of a great game. Zookeeper DX Touch Edition is one of those games. Originally released as an online puzzle game, Zoo Keeper was then ported onto the Nintendo DS in 2004. A Playstation edition shortly followed, and then everything was quiet on this games front. Fast forward seven years and Zoo Keeper was revived once again for the iPod, and entitled Zookeeper DX Touch Edition. Fans of the original version will notice that the game play is the same here. 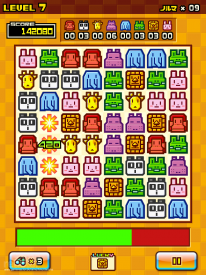 The game play simply involves matching three of the same animals or more in lines in order to progress to the next level. As simple as this sounds, the difficulty (as expected from games like this) gets increasingly hard, until the point where panic sets in. Fail and it's right back to level one again. As disheartening as that may sound, it really isn't too much of a hardship. The addictive nature of the game play makes you want to keep attempting to beat your previous high score. The matching into sets of three of more element has been tried and tested many times before (think Bejeweled for instance), but the cutesy animal graphics definitely set this apart. Players have a choice of two modes, Normal, where you keep playing until the time runs out, and Tokoton, in which the player must catch 100 types of animals in order to progress to the next level. What is missing from the original is the Quest mode, which allowed players to complete a variety of challenges in order to move up the levels. This mode was one of the most enjoyable aspects of the original, so it seemed a shame that it was not included on the iPod edition. Upon it's release, Zookeeper DX Touch Edition suffered from a number of bugs, including the occasional freezing screen and ratio problems. However, it appears that these problems have been ironed out now, and thankfully I have not encountered any more. I was somewhat disappointed that the leader-boards do not have the achievers name next to it. As someone who shares an iPod with another, it is hard to remember who scored what when there is no option to input a name next to a high score. In conclusion, Zookeeper DX Touch Edition is a highly addictive puzzle game for the iPod. Whilst it may lack the Quest mode of the original game, the game play on offer is very accurate to the previous version, so fans should enjoy this. The cute graphics heighten the game's appeal, and add to the overall enjoyment. Whilst the game gets incredibly hard as the levels progress, it does sour the games experience. In fact, the challenge is welcoming, and helps to keep people coming back once again to attempt to beat their personal high score. At only 69p in the App store, this is quite a bargain when you realise you've pumped a considerable amount of hours into it. Just warning you one last time though, it IS addictive. great game ... i love it ..